The Mahamudra Holiday Workshop: The Love of the Buddhas differs from other Tantric workshops in that it incorporates Tantric meditation practices. The seminar house Shambala Oceanside Resort is located directly by the ocean. The rooms, in beautifully furnished garden huts, are embedded in a tropical garden which invites you to relax. You can use this wonderful environment and your sexual energy to enter a state of meditation and connect with your buddha-nature. By immersing yourself in the Tantric consciousness and bringing that attitude to your sensuality and relationships, your relation with yourself and your partners will continue to deepen and refine. 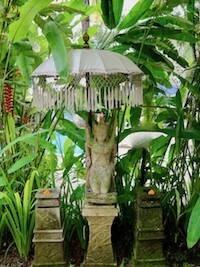 In Bali, you are close to the magic of life. You will be enchanted with the people and wonderful landscapes, by the water temples, tropical waterfalls, rice terraces and the lively city of Ubud with its ancient handicrafts. Paradise nature and intense encounters with oneself and other participants reveal the divine principle of love. This journey to Bali is a very special experience. When love meets meditation, then Tantric transformation can happen. Inspired by the peacefulness of the people and the beauty of the island, you immerse yourself in a world of exotic nature and you recognise the divine principle in everything. Mahamudra takes you beyond the boundaries of personal relationships into merging with the source of Being. Mahamudra is the orgasmic union with the universe: an orgasmic feeling for the whole, the flowers and trees, the birds and butterflies, the stars and the sky, the sea and the entire universe. You can share the state of Mahamudra with a partner, but to experience it you do not need a partner. The orgasmic union arises from your inner let-go and the connection with your innermost divine being. In this wonderful process of going in we include practicing yoga in the early morning in the awakening nature, and various quiet meditation techniques that involve tantric elements. Together with your partner, you open yourself up to the divine lover within you, and all separation dissolves. Awaken your liveliness as a woman and your depth as a man! A variety of active meditation techniques, which are designed for the modern Western people, will enhance our seminar program and support you to come closer to your inner source. The world is full of activities and it is often difficult to relax. Even in meditations we are still trying to do our best and gain a good result through making an effort, instead of simply being ourselves and enjoying resting in the silence of your center. We have forgotten how to relax and be natural. Active Tantric Meditations, with various movement stages, will deepen our natural ability to feel and reconnect to inner silence. could show you the way back to God, the Source, to yourself. a sense of awe, of wonder, arises within you. and reflects your own essence back to you.